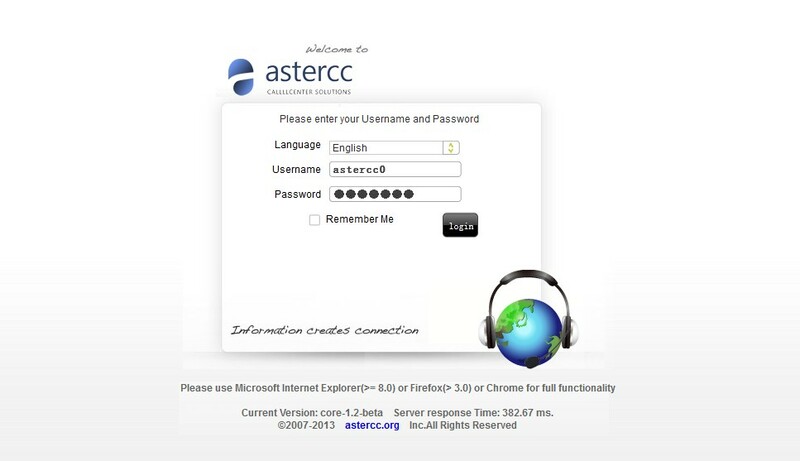 After installation, enter the server ip in your broswer, such as: http://192.168.1.110, 192.168.1.110 is the IP of astercc server, the default system administrator user & password is admin and admin. we suggest that user use FireFox or Chrome browser. On the left menu, click [User] → [Quick Setup], go to qucik setup page, we can add a batch of account, device and agent. It provides 5 agents for trail, so we select agent & device. Click [Next] go to the setup page. Password Prefix: temp23, the password prefix of account password and agent password, when the length of password prefix is same as password lenght, means it will use same password above. Click [Preview] button, you will see the account detail it is about to generate. 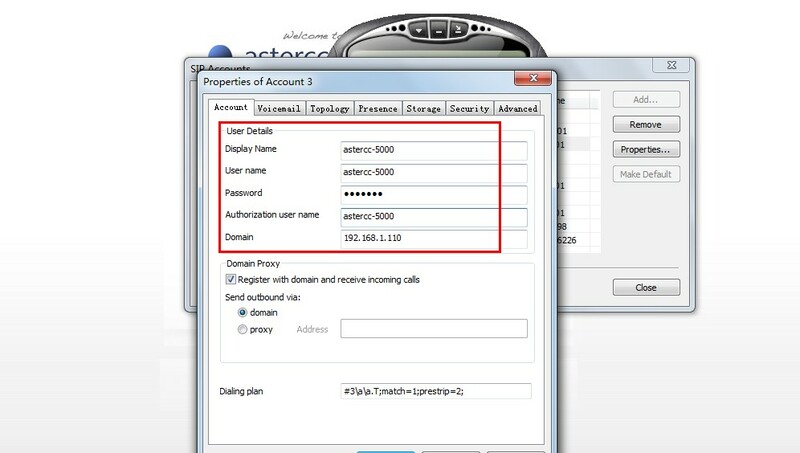 Click [Save] button, it will generate the accounts, devices and agents. We will see a reload bar at the top, click the bar, the changes we made will be applied. Click [Add], it will move all agents into the agent group, we check [group admin] for 5000, 5001. When it’s done, we also need click the bar to apply the changes. asterCC supports all kinds of softphone, gateway or IP phone as long as they support SIP 2.0 protocol, in this post, we use eyeBeam softphone as a sample. 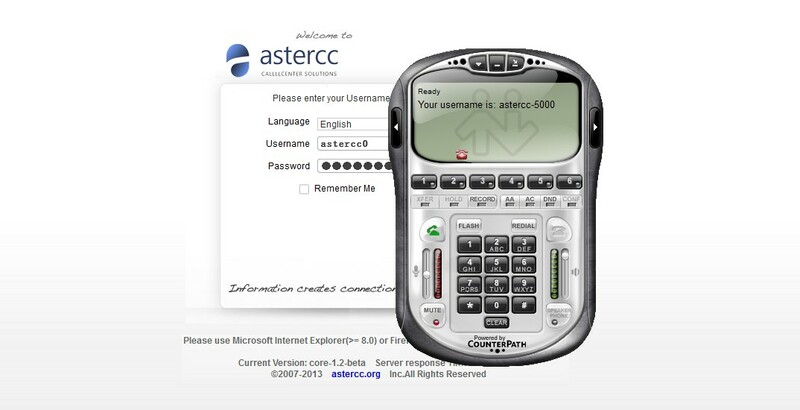 go to SIP account configration, please notice that it should use astercc-5000 rather than 5000 (astercc is team identify), password use “temp123” which we configed above. Click [Save], then the softphone is ready. 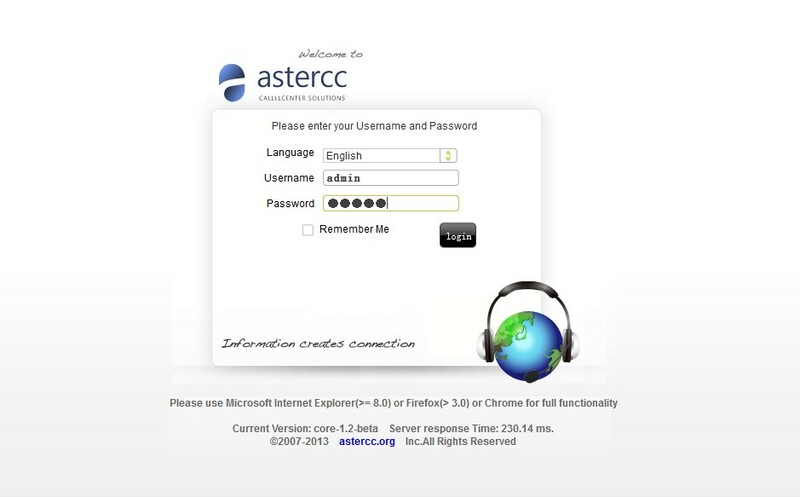 In order for us to make & receive calls from asterCC, we need config trunk, in this case we use a SIP trunk. Click [Save] then it’s done, if you didn’t select team for this trunk, it will prompt if you want to config this trunk as the default outbound trunk for a team, click [OK], means the team astercc will use this trunk as the default outbound trunk. Inbound route is used to route a call by DID, trunk or time condition, here we add a default route so all incoming calls will be routed to the queue we created above. Agent could only work when he’s checked-in, click [Login], agent will check-in all agent group he belongs to. Orange Icon means it’s usable. In group panel, agent could choose which agent group he want to check-in, choose current agent group, ACW mode, work mode. Red means it is ringing. Green meas call is answered. In order to get popup when agent have calls, we can install different modules depends our business, here we use the new customer service module as a sample. Go to [Customer Service]→[Customer Service], click [Add] to create a new customer service page, select the agent group we created. Login in as an agent, make a call from the softphone, you should see the popup as the screen shot. Agent could see all missed calls in this page (A missed call is that call reachs a queue, but never answered by any anget), they can call back or create a workorder. Agent could check his own call records or listen/download recordings.